When it comes to water parks, we are typically happy with some chicken nuggets or a fair hot dog or hamburger. We aren’t looking for something fancy, certainly not a sit down meal, more along the lines of something quick that we can grab on the go and that is comparable to most fast food restaurants. So, you can imagine that I was a bit surprised when I happened upon something out of the ordinary at Typhoon Lagoon’s Leaning Palms. Mixed in amongst the hamburgers, salads, nuggets and wraps was a menu item simply listed as Chicken with Rice and Beans. No clever name, no over the top hook to grab menu gazers. Yet, it was that simplicity that drew me in. In fact, taking it a step further, even the description underneath the title gave nothing away, as it stated that it was chicken with fried plantains, rice, and black beans. From that depiction at least we found out about the plantains and what kind of beans were to accompany the chicken. The picture on the menu showed it as everything put together in a bowl, but with so little to go on, I was intrigued and had to order it. 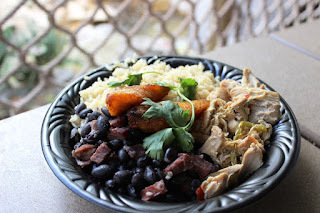 What I received was a bowl with a fair helping of cilantro rice as its base, black beans that had been prepared with pieces of pork (I stop short of calling them ham hocks), a pair of fried plantains, and pieces of stewed chicken. It was definitely more than I expected from a quick service restaurant in a water park, and I was pleasantly surprised to see the menu at Leaning Palms leaning in on changing and diverse tastes. This is definitely the type of dish that I had seen made from scratch in more than one friend’s house growing up in Florida. Now, Typhoon Lagoon’s Chicken with Rice and Beans is not up to those homemade standards, but I would never expect it to be. I was surprised by the flavors the chicken had, a hint of heat, but more that it lingered in the background and gave way to the Latin seasonings and aromatics that the chicken had been prepared with. The black beans held their shape well, but were a bit mushy, while the pork added a nice richness. The rice was fragrant, but was only the base or filler for the most part. As for the plantains, they had a thin crisp crust, but were warm and sweet inside. I must admit I was pleasantly surprised by the Chicken with Rice and Beans from Leaning Palms. It was nothing of what I would have expected from a water park lunch, but it is everything I would want in one. Great flavors in a distinct set-up that makes it stand out from the pack of typical Typhoon Lagoon fare. Don’t try to compare it against some of the better meals on property, but for what it is, this dish is a stand out!